Non-members are welcome to use our facility on a drop-in basis, register for programs or book any of our services. Use Kids’ Corner babysitting while you visit, book a massage, or recover faster from injury at our Rehabilitation & Sports Injury Clinic. 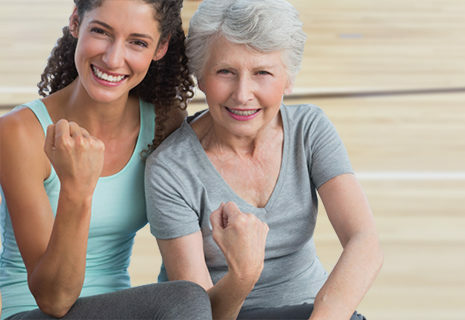 If paying a drop-in fee or attending with a member on a guest day, guests can take part in our weekly classes (excluding aqua) as well as intramurals and badminton/pickle ball court bookings at no additional charge. While some classes require sign-up at the front desk, most are drop-in friendly. To find class descriptions, including levels and sign-up requirements, check our Exercise Schedule. Guests must be ages 16+ to use the facility and must create a profile at our front desk on their first visit or “Become a Guest” online at our website. Once you have a profile, you can log in at our site or use our app to book services, register for programs and update your account securely from a tablet, phone or desktop computer. If you have registered online for programs with us in the past, you can continue to use your existing log-in details and will already have a guest account with us. Members are invited to bring a guest to enjoy the facility on certain days throughout the year. The guest will have access to all the amenities and classes they can usually access when paying a drop-in fee, pending availability. Parking in the free member lot is NOT included with most programs or guest services at our site. There is paid parking available onsite in the visitor lot (on the right when entering from Watson Street). Limited free street parking is available nearby on Watson Street and Court Street. Find out more about parking when visiting our clinic. Plus GST. Must be 16+ to attend. No pool access.